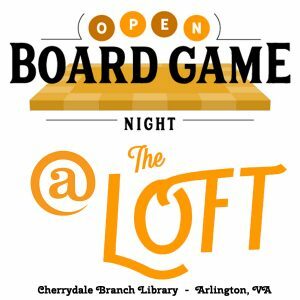 Open Board Game Nights offer a chance for all our neighbors to gather together and play games as a larger group. Unlike our private game night events that center around one game and are only open to small number of participants, Open Game Nights include a large selection of games from our library and no group size restriction. Plus, you don’t have to sign up or register in advance! Just show up! Feel free to bring a friend, family member, neighbor or co-worker. Also, you are welcome to bring your own games. Maybe you have a board game in your closet you have been itching to play with others – bring it! Or, you can just arrive, select one from our library and find others in the room to join you. These open game events are open to everyone, even if you have never registered with our group, been to one of our meetups or even met us at a convention. You do not have to be a member of the NOVA Board Game Group. Anyone over the age of 18 is welcome!